Why do I care how well I did or didn't play in the second game of a back-to-back in net? Half the guys on the team I'm subbing for don't know my name. The few who did probably forgot it before they got on the ice. Sure they appreciate having a goalie show up so they can actually play the game but there's really not much more to it than that. But I care. I think that it's one of the things that comes along with being a goalie. You care how you play each game because more than any other position in hockey, you can make a difference in the outcome. If there's a common characteristic in the goalies I know it's that they care. They feel the pressure to perform and they like it. No matter the level, I haven't met one yet that doesn't. So last night as I waited for the Zamboni to do its thing, I was worried about my second game in a row. I had played well in the first game- only allowing one bad goal due to a bonehead play on my part. I even managed to keep their best player off the score sheet until the last 5 minutes of the game despite repeated high quality chances. My team finished with a 5-3 win and everyone was happy in the locker room. But I was about to start my second game and I knew my legs were shot. My gear was sopping wet and my heart was still playing the samba from a late flurry of action. I knew I didn't have much left to give to the next group of guys waiting to play. It started out OK. I made some solid saves early in the first and I was starting to feel optimistic after we went up 2-0. But deep down I knew that I was fading. I've never asked another old goalie how they deal with back-to-backs (There aren't many around to ask) but unavoidably I start trying to manage my energy. Choosing not to drop down on a play or half-assing crease coverage in my zone and hoping my defense clears the puck without incident. It's like an ongoing negotiation with myself. I measure the danger level of the play and begin passing up on the effort it takes to provide back-up coverage or protection against crazy bounces. This continues with the scales tipping towards risk as my body gives up. Inevitably, I started letting pucks past that normally get stopped and of course the game went to a shootout during which I probably looked more like an usher showing patrons to their seat than a netminder. "Right this way Sir. Your reservation for a goal is right here." I wasn't able to give my best to the team that won't remember who played the game in net for them. They deserved to get my best and I gave them what I had left after emptying the tank in the game before. What's the point in all this self-immolation and angst over another beer league game? It's because I care. Goalies care. 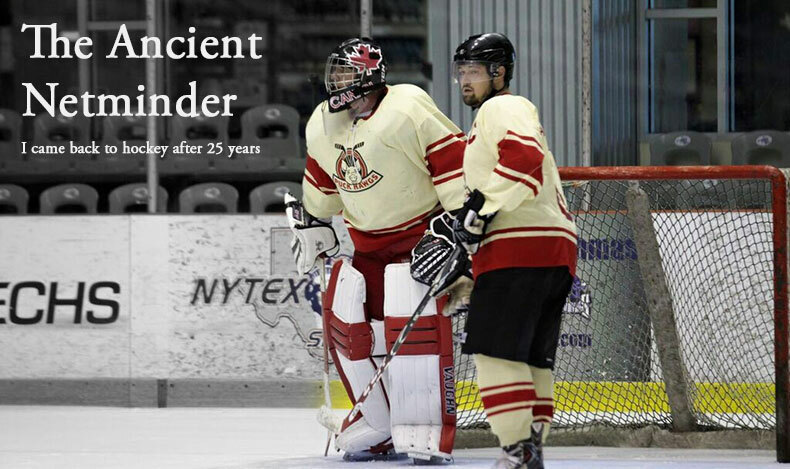 Last night may be the last back-to-back for this Ancient Netminder.